Elizabeth lives in the Unided Kingdon. I would love to read this book b/c it sounds so unique ;) Thanks for sharing! I would love to read more about Ash and Natalie! Looking forward to Elijah, Ash, and Natalie taking down Purian Rose. 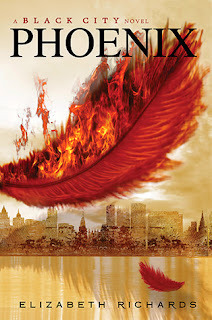 I read Black City and loved it so I can't wait to read Phoenix to see what happens next! Thanks for this amazing giveaway - I would love to win! I haven't started the series yet because I want to devour them all at once! Enjoyed the first book and looking forward to reading the second one! Thanks! I have heard great things about the series. It just has such a fascinating premise and I've heard great things about it. I want to know what happens to Ash and Natalie!!! Absolutely loved Black City! Very interesting and different plot, great characters and all and all, one heart-stopping book. Really looking forward to Phoenix and Wings. I read the first book which was amazing! I have to read the second! I love the Black City Series!!! I can't wait for Wings to come out.